Find out how to drive TV engagement before, during and after viewing. 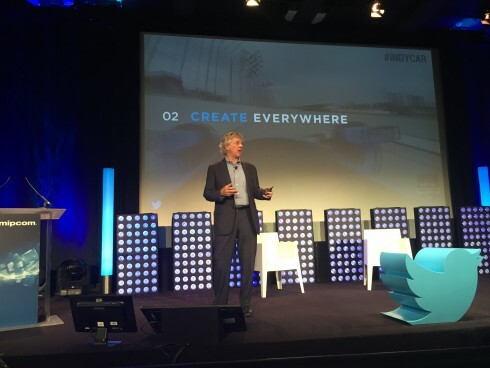 This afternoon Twitter’s team — Dan Biddle, director of broadcast partnerships, Twitter UK; Fred Graver, creative lead for the global TV team; Anjali Midha, global media and agency research director; and Justine Ryst, director of media partnerships, Twitter France — hit the stage for an hour-long keynote to discuss their latest products and research for television. At the end of the panel, Ryst held a Q&A with special guest Bassem Youssef, host of Al-Bernameg, otherwise known as the ‘Egyptian Jon Stewart‘. Biddle kicked us off with a stirring speech about the state of the TV industry. Twitter’s total viewing audience totals one billion people. 700M+ of that total are accessible via Twitter’s Audience platform. 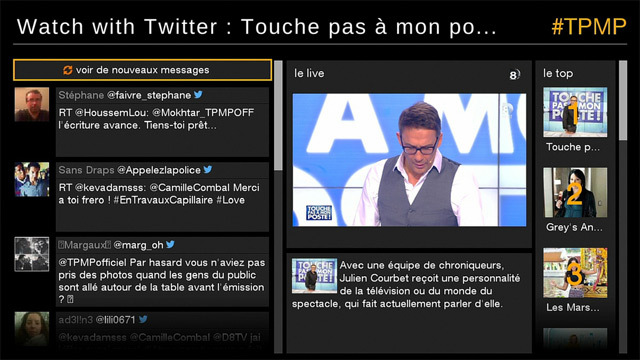 A few examples of how Twitter’s worked with television programmes include Dancing with the Stars, which used Twitter votes and Twitter’s Vine booth to propel engagement; Nouvelle Star in France, which also used Twitter votes, sponsored by Deezer right on the platform; The Voice, whose #voicesave hashtag let people take contestants out of the danger zone in a given episode; and Big Brother, which used Twitter Mirror—an iPad connected to the platform—to let contestants tweet “save me selfies” and other communications to fans and viewers. “With all this distribution and content, how do we get it out there?” Biddle asked. He also reminded us of #TheDress, an odd viral phenomenon that began when a woman posted a picture of a dress to her Tumblr, which only had about 27 followers. She was arguing about its colour (blue and black, or white and gold?) with a friend. This argument quickly spread across the web when Buzzfeed’s editor found it, wrote it up, and tweeted it around 5:47am. That single tweet drove 975,000 pageviews. By 8:54am, it was on The Today Show. “That tweet was the spark that went into the gas tank and exploded, sending that dress everywhere,” Biddle proclaimed. He also announced the launch of Timeline, a new feature that appeared on iOS devices within Twitter’s app. When you click on the new lightning bolt icon, you’ll be given a list of moments that are currently trending; clicking on a moment will drive you to a subpage where you can check out related tweets, cast, episodes and media, in the case of television shows. “We set up a timeline for MIPCOM,” said Biddle, who showed it to us right then. 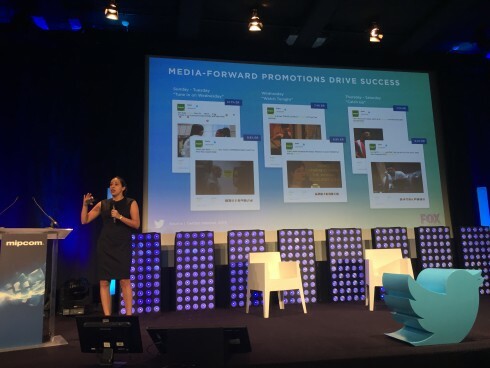 The MIPCOM feed included separate sections for tweets, cast members of shows attending the salon, and media—content related to the event. Biddle then passed the baton to Graver, who talked about various tools broadcasters can use to get their shows out there. “We think of all the great storytelling you do, and we’re figuring out how to get it on our platform in ways our users will appreciate it,” said Graver. “All the Twitter video work we do takes into account the TV industry. We have always set ourselves up as partners for you,” said Graver. According to data from Research Now, users come to Twitter primed to discover new videos. “So if you’ve got a TV show or network, on YouTube people will search for your clip because they already know your clip exists. Twitter is where you go to find new audiences; people are looking to discover new content,” Graver said. 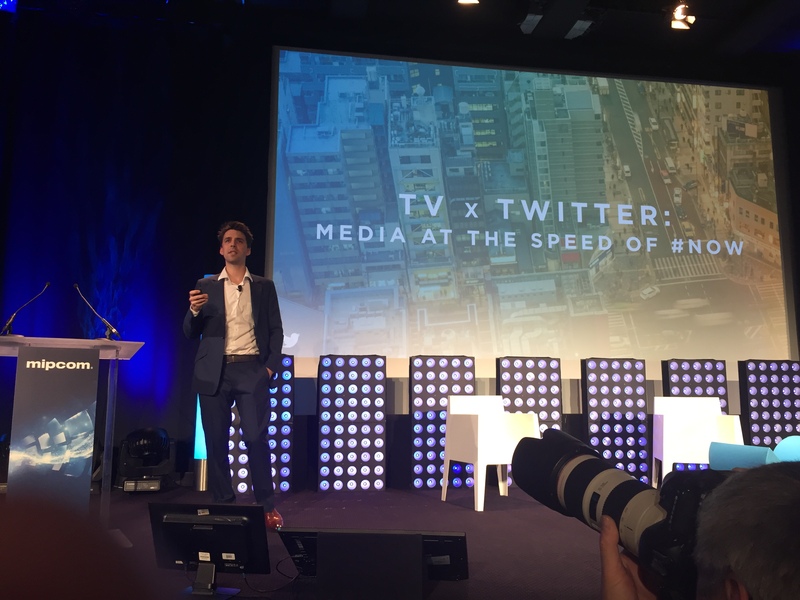 He talked about the native video platform Twitter recently created, which “makes it easier for you to upload things onto our server and share them.” This platform is for people who produce content; it lets them time publications before, during and after a show’s airtime. “Engage the audience anytime they’re interested in talking about you,” Graver said. Twitter also improved its Snappy TV platform, which lets you edit videos live and share them. In total, 1.5bn Vine loops are watched daily, and 200M people watch Vine every month. The Teen Choice Awards, for example, used Twitter Challenger to ask celebrities to do the whip & nae nae dance. “We vined it out and made great content online and on TV,” said Graver. Notably as well, this week at MIP Twitter shared an award with Orange in France for its watch with platform, which lets you choose a programme based on its popularity on Twitter. It is also being used by Comcast in the US as well as device manufacturers. In other words, there are a number of Twitter tools you can use to ensure your programme is not only top-of-mind but exceptionally engaging. “When constructing shows, designing them, and on preproduction, make content on Twitter, Periscope and Vine. We know that it works,” Graver concluded. And to put data to that manifesto, Anjali Midha hit the stage next. “We know we can connect massive audiences in front of our TV sets in those magic hours of primetime,” Midha began, noting that, during that period, both internet and mobile use increase as well. “We might have started out as a text-based platform, but today, any and all types of media can attract users to your content, so think about creating special content for folks,” Midha went on. She used the example of Empire, the most social series in Q1 2015 with 647M earned impressions from an earned audience of 32,4M. Midha described the “earned audience” as “an audience that’s ripe with FOMO”—or fear of missing out, as the kids say. To take advantage of this Empire-thirsty throng, the team created special tune-in calls to remind them to tune in or catch up. From Sunday-Tuesday, all Twitter efforts had a single message: “Tune in Wednesday.” Wednesday’s messaging was “Watch tonight”; from Thursday-Saturday, it was all “catch-up” related. The strongest lifts occurred among those between the ages of 18-34. Intent to watch live rose 21%; intent to watch time-shifted rose 16%; and, among those targeted with paid media, one in seven intend to view either live or via time-shifting. More social shows also command higher ad rates, over 30% higher than less social shows across age groups, Midha added. Currently Twitter is alpha testing a product that lets them do their Empire tune-in experiment at scale. Twitter Amplify was improved so that it is now global, automated, always-on, and able to target all content (not just sports). “We’ve made huge advances in the past year. We went from regional to global, manual to automated—not only can you bring your TV sponsor with you, we’re developing a content marketplace,” said Midha. Amplify works with 200 premium advertisers globally, a figure that changes daily. “Advertisers you seek to work with are ready and waiting for you guys to bring content to the platform,” Midha said, who pointed to the MTV VMAs’ use of Amplify, by posting a Taylor Swift clip on Twitter, sponsored by Pantene Pro-V. This instance enjoyed a 28% lift in emotional response among those targeted. “Emotional responses are predictive of future tune-in and influence on other folks,” said Midha. In keeping with that, the brand partner saw a 23% lift in sales. After this, Twitter’s Justine Ryst appeared onstage to introduce special guest Dr. Bassem Youssef (shown at the top of this post), billed as the “Jon Stewart of Egypt” for his satirical show Al-Bernameg. As a “revolutionary broadcaster” in the Middle East with over 5m followers, this resident fellow of Harvard’s Kennedy School of Government “know a little bit about that ‘parkour’ audience,” Ryst said. Youssef appeared with a smile and described the unique struggles he faced in producing a show that is critical of the Egyptian government. “We continued to broadcast under a lot of pressure. And we fought and continued to fight until I lost my show,” said Youssef. “You were a heart surgeon. What made that complete shift in your life?” Ryst asked him. The Arab Spring gave birth to an enormous revolution in original content, including his own idea for a show. “People think this was just a trial and we were just having fun. From 2010-2011, there was hardly any original content for digital platforms anywhere in the Arab world,” said Youssef, who worked with friends to build Al-Bernameg, meant to curate internet talent and take them mainstream. To better understand these tools, he reached out to people for assistance, which helped him grow an audience. “At first I thought, 140 characters for an Arab? It’s not possible!” Youssef quipped. “We like to elaborate, use our hands. Now 140 characters is more than enough.” He also said he works to “differentiate between critics and trolls. You need to listen to people,” but consider the context of what they’re saying. “It’s about how you manage the explosion of emotion on Twitter and choose what’s best for your show and content,” he said. Failure by other media giants in Egypt to understand the medium also provided fuel for his efforts. “Many of our news outlets actually get news from fake accounts and parody accounts, and they’d look stupid, and it would be more stuff for us to make fun of,” he revealed. Youssef also talked about how he uses Twitter. “Twitter is where you go for the score of the game. If you want to actually verify a piece of info or news, we go there. It connects us more to the news, and helps us verify fake news and information we get in order not to be embarrassed in our own show.” He playfully added, “I like to follow the news, so I follow comedy shows”—incidentally, it was via Twitter that he was ultimately put on Jon Stewart’s radar, and vice-versa. “When people are watching the show, they’re not just watching; they’re live commenting,” Youssef went on. To conclude, Ryst asked him what’s coming next. 70% of the Middle Eastern populace is under 40, “an incredible power waiting to be unleashed,” he said.